This was an article in Above Rubies Magazine from October 2012 and I kept it because it was so powerful. I decided to type it up for all of you to read so it can encourage you, too. It was written by Jennifer Flanders who had 12 children at the time! Actions speak louder than words. You can say you respect your husband, but he’ll have a hard time believing that unless your behavior backs it up. What does respectful living look like? 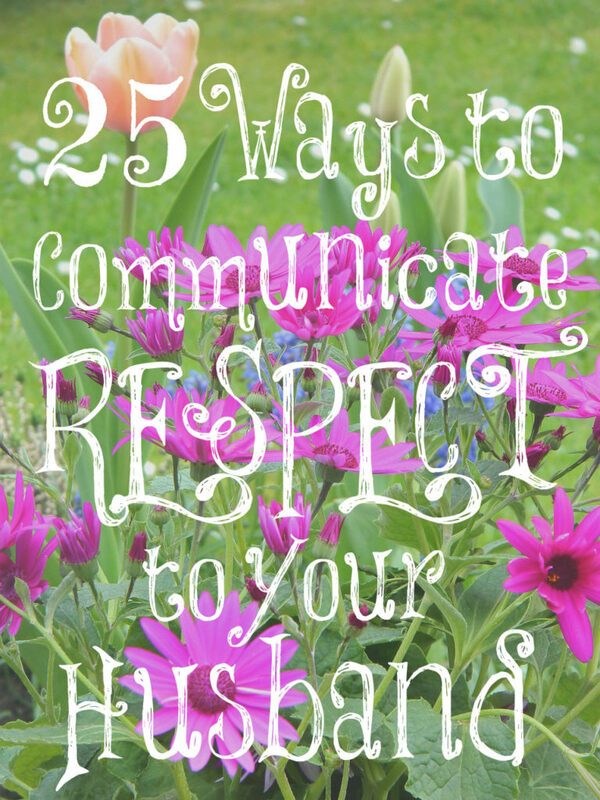 Here are 25 ways you can communicate respect to your spouse without uttering a word. If you’ll make it your habit to do these things, the next time you tell your husband how much you respect him, he won’t have to wonder if you really mean it. Choose Joy. It’s true: A happy wife makes a happy life. Please don’t use moodiness as an attempt to manipulate your man, but in all things rejoice, because that’s the right thing to do (1 Thessalonians 5:16; Philippians 4:4). Honor His Wishes. Give weight to what your husband thinks is important. Make those things a priority that matter most to him, whether it’s having dinner ready when he gets home from work or keeping the house tidy or limiting computer time. Don’t make him ask twice (Philippians 2:4). Give Him Your Undivided Attention. Yes, I know that women are masters of multi-tasking, but when your husband is speaking to you, make a point to lay other tasks aside, look into his eyes, and listen to what he is saying with the goal of understanding and remembering his words. Don’t Interrupt. Have you ever been around a person who won’t let you finish a sentence? That gets old fast. Even if you think you already know what your husband is going to say, allowing him to say it without cutting him off mid-sentence shows both respect and common courtesy. Emphasize His Good Points. Sure, he has his faults (as do you), but dwelling on them will only make you (both) miserable. Choose instead to focus on those qualities in your husband that you most admire (Philippians 4:8). Pray for him. Ruth Bell Graham advised wives to “tell your mate the positive, and tell God the negative.” Take your concerns to God. 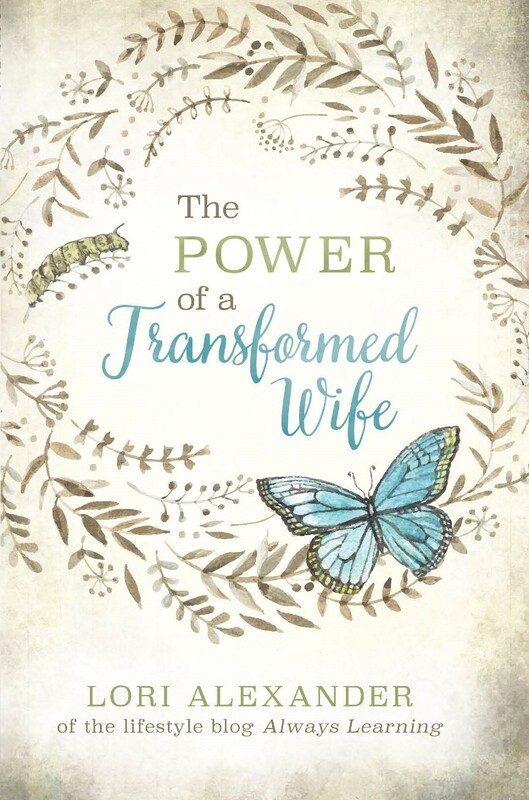 Faithfully lift up your husband in prayer every day, and you will likely notice a transformation not only in him, but in yourself, as well (Philippians 4:6, 7; 1 Thessalonians 5;17). Don’t Nag. Your husband is a grown man, so don’t treat him like a two-year-old. Leave room for God to work. You are not the Holy Spirit, so do not try to do His job. Be Thankful. Cultivate an attitude of gratitude. Don’t take your husband for granted. Be appreciative for everything he does for you, whether big or small. Always say thank you (1 Thessalonians 5:18; Ephesians 5:20). Smile at Him. Smiles spread happiness. Smiles have even been shown to create happiness. Smiles are contagious. And a smile makes any woman more beautiful. Respond Physically. Did you know that the way you respond (or don’t respond) to your husband’s romantic overtures has a profound effect on his self-confidence? Don’t slap him away when he tries to hug you or make excuses when he’s in the mood. Your enthusiastic cooperation and reciprocation will not only assure him of your love, but will make him feel well respected, too (1 Corinthians 7:3-5). Eyes Only for Him. Don’t compare your husband unfavorably to other men, real or imaginary. It is neither fair nor respectful and will only breed trouble and discontent. Avoid watching movies or reading books that might cause you to stumble in this area, as well (Psalm 19:14; Proverbs 4:23). Kiss Him Goodbye. I once read about a study done in Germany which found that men whose wives kissed them goodbye every morning were more successful than those who weren’t kissed. Success and respect often go hand-in-hand, so be sure to send him off right, and don’t forget to greet him with a kiss when he returns home for good measure. Prepare His Favorite Foods. Although the rest of the family is not overly fond of spaghetti, my husband loves it, so I try to make it at least two or three times a month as a way to honor him. Next time you’re planning meals, give special consideration to your husband’s preferences (Proverbs 31:14, 15). Cherish Togetherness. I love to sit near my husband, whether at home or away. Our church shares potluck dinners every Sunday afternoon, and although the men and women normally sit separately to visit, I like to position myself close enough to my husband that I can listen to the conversation, as I think everything he says is so interesting. At home, I’ll take my book or handwork to whatever room in the house he’s working in just to be close to him, because I enjoy his company even when neither of us is talking. Don’t complain. Nobody wants to be around a whiner or complainer. It is grating on the nerves. Remember the serenity prayer: accept the things you can’t change, courageously change the things you can, seek wisdom to know the difference (Philippians 2:140). Resist the Urge to Correct. I know one wife whose spouse can’t tell a story without her stopping him fifteen times to correct inconsequential details: “It wasn’t Monday evening, it was Monday afternoon…It wasn’t blue, it was turquoise…He didn’t ride the bus, he took a shuttle.” Please. Please. Please. Don’t ever do that to your husband – or to anyone else, for that matter (Proverbs 17:28). Dress to Please Him. Take care of your appearance. Choose clothes your husband finds flattering, both in public and around the house. Keep the House Tidy. To the best of your abilities, try to maintain a clean and orderly home. Seek to make it a haven of rest for your entire family (Proverbs 31:27). Be Content. Do not pressure your husband to keep up with the Jones’. Take satisfaction in the lifestyle he is able to provide for you (1 Timothy 6:6-10; Hebrews 13:5). Take His Advice. Do not dismiss his opinions lightly, especially when you’ve asked for his counsel in the first place. Make every effort to follow your husband’s advice. Admire Him. Voiced compliments and heartfelt praise are always welcome, but you should also make it your habit to just look at your husband in a respectful, appreciative way. Think kind thoughts toward him. He’ll be able to see the admiration in your eyes (Luke 6:45). Protect His Name. Honor your husband in the way you speak of him to family and friends. Guard his reputation and do not let minor disagreements at home cause you to speak ill of him in public. Live in such a way that it will be obvious to others why your husband married you in the first place (Proverbs 12:4; 22:1). Forgive His Shortcomings. In the words of the late Ruth Bell Graham, “A happy marriage is the union of two good forgivers.” Please do not hold grudges against your husband. Do not allow a root of bitterness or resentment find a home in your heart. Forgive your husband freely, as Christ has forgiven you (Mark 11:25; Matthew 18:21-35). Don’t Argue. You are not always right, and you do not always have to have the last word. Be the first to say, “I’m sorry.” Be willing to accept the blame. It takes two to argue, so “abandon a quarrel before it breaks out” (Proverbs 17:14; 21:19; 25:24). Follow His Lead. If you want your husband to lead, you must be willing to follow. Neither a body nor a family can function well with two heads. Learn to defer to your husband’s wishes and let final decisions rest with him (Ephesians 5:22-24). He who finds a wife finds a good thing and obtains favor from the Lord (Proverbs 18:22). Do these 25 things consistently, and your husband will never have trouble believing that fact. This is a wonderful list. Thank you so much. Thanks Lori for the lovely reminder 🙂 ! I love to read these types of great reminders!! I always zero in on a few that have my name written on them, and remind myself to pick up the slack concerning these areas! And I am also reminded how blessed I am with hubby.Thanks Lori! Sad thing is, the women who could most benefit from this list are also the ones least likely to read it, and most likely to reject it out of hand if they do read it.